AdaCamp is an unconference for people interested in supporting women in open technology and culture, organized by the Ada Initiative. The first AdaCamp was held on January 14, 2012 in Melbourne, Australia. “Adacamp was the first event of the Ada Initiative, and based on the calibre of the attendees, the quality of conversations, the extent of networking, and the amount that I learnt, I know I cant wait til the next one,” said attendee Naomi C..
AdaCamp Melbourne brought together people interested in issues facing women in open technology and culture, to share their experiences and develop ways to support and promote women. People attended from all over open tech/culture: open source, libraries, open data, community radio, fan culture, Wikipedia, wikis, maker culture, researchers studying these topics, and more. Overall, the conference was rated a great success by the attendees, who asked that future AdaCamps to be two days long instead of just one. AdaCamp Melbourne was a one day unconference” in which the attendees decide what to discuss. This AdaCamp had 21 sessions across 7 time slots, as well as a group opening at the beginning of the day and a curated feedback session at the end of the day. The topics included fighting Impostor Syndrome, valuing more diverse skills when hiring in IT, sharing successful tactics for encouraging women from different areas of open “stuff,” preventing volunteer burnout, getting women involved in open source, creating mothering and caring friendly spaces, and teaching feminism in geek communities. The day ended with a Girl Geek Dinner open to all. The most important accomplishment of AdaCamp was connecting people from different areas of open technology and culture so that they can share best practices and support each other. “AdaCamp stood out for me from other conferences because everyone participated and seemed to really want to go beyond the conference and drive things out in the real world,” commented attendee Cobi Smith. We shared what works for supporting women in one field of open tech/culture with people in other fields. Many people felt validated, energized, and inspired to continue their work as a result of AdaCamp. Given the high burnout rate for women in open tech/culture, this is no small feat. Several sessions produced new or improved documentation, often hosted on the Geek Feminism wiki: fighting Impostor Syndrome, valuing diverse skills and women-oriented hiring, and preventing volunteer burnout. We also learned more about each other’s communities, including success stories like the majority female development community behind open source software project Dreamwidth and challenges facing librarians fighting for open access to knowledge. And many more, including Ada Initiative co-founders Valerie Aurora and Mary Gardiner. Several people who were invited couldn’t come due to conflicting obligations and many more expressed great interest in attending but could not afford to travel to Melbourne. Thanks to our generous sponsors, we were able to provide limited travel grants to several participants. We expect that many more people will be able to attend an AdaCamp in North America with longer notice and more generous travel grants. Based on the success of the first AdaCamp, the Ada Initiative will continue holding AdaCamps in different areas of the world. Our next AdaCamp is tentatively scheduled to be held in July 2012 in Washington D.C., prior to the global Wikimania conference for Wikipedia and related projects. We expect a lot of overlap between attendees of Wikimania and AdaCamp and encourage people to attend both conferences. Want to attend the next AdaCamp? To get notified when applications open, watch this blog, our announcement email list, or our Twitter account. We are primarily looking for people with a track record of participating in open technology and culture, supporting women in these areas, and contributing positively to discussions. We strongly encourage people to nominate or suggest other people for attending AdaCamp, especially people with unique experience or knowledge. We will have a number of modest travel grants available so that a greater variety of people can attend. Sponsoring AdaCamp is an excellent way to show your organization’s commitment to bringing more women into open source, Wikipedia, and other other areas of open technology and culture. AdaCamp sponsors benefit from positive publicity, improved recruiting opportunities, and community good will. Sponsors of AdaCamp Melbourne received credit on the AdaCamp Melbourne web page, at the opening and closing sessions, and in AdaCamp announcements. We are considering new sponsor benefits for the next AdaCamp, including reserved attendance slots and access to attendees outside conference hours. Web sites for specific AdaCamps (with sponsor logo and information) will remain available after the event concludes. Contact adacamp@adainitiative.org for more information on sponsorship at any level. Thank you to our sponsors: Google Australia, Wikimedia Australia, Linux Australia, and Atlassian; to Alex Bayley for venue research and website content; to Danielle Madeley and Brianna Laugher for catering; and to the AdaCamp participants for making the event a success. This entry was posted in AdaCamp and tagged adacamp melbourne, australia on February 4, 2012 by valerieadainitiative. You’ve probably noticed that in December and January the Ada Initiative is running a major fundraising drive. We hope to fund several months of activity in 2012 through this drive. We deeply appreciate your support so far. Help us reach our goal in January 2012! Supporting the fundraising drive has taken a lot of behind the scenes work, particularly configuring and customising CiviCRM, our donation management software, and associated donation workflows. CiviCRM is an open source project recommended to us by EFF staff as substantially outperforming proprietary software in the same space. While this fundraising drive has again consumed a lot of staff time behind the scenes, unlike the rather one-off work we did on our Seed 100 drive, where we manually raised invoices, reconciled payments and assembled the mailouts, our work setting up this fundraising drive is extremely reusable. We’re thankful to be running a successful and this time repeatable fundraising campaign! In addition to fundraising work, we’ve spent the last month completing the organisation of AdaCamp Melbourne. We expect more than 35 participants to join us at the CERES Environment Park for our first ever AdaCamp. Participants are joining us both from Melbourne communities, and from all over Australia, including several participants from Western Australia. We’re also thrilled to have two women from New Zealand and one from the Philippines flying in to join us for the event. While some of the work of AdaCamp will need to be redone for future eventsâ€”for example, venue research and hire, and recruiting and selecting AdaCampers themselvesâ€”we’ve learned a lot from this first event that we’re looking forward to use in hosting future AdaCamps. We were advised in mid-December that our application for tax exemption in the United States awaits a fuller review in 2012. We are conferring with our legal and tax advisors on the likely review date and related matters, but are unlikely to have further news to report for some months. Existing donors filing US taxes should seek advice from their tax professional regarding showing their donation to the Ada Initiative on their tax filings. Valerie and Mary are both attending the Ada Initiative’s own AdaCamp Melbourne on January 14. We’re looking forward to working with the Australian community on women’s open technology and culture participation. We will also be at the Girl Geek Dinner that evening, open to all geek women and their guests. In December, Dreamwidth Studios pledged 10% of their gross December revenues to the Ada Initiative. Their final donation amount means that they become the Ada Initiative’s third Venture Philanthropist sponsor! Thank you once more to Denise Paolucci and Mark Smith, co-owners of Dreamwidth, for your generous support of the Ada Initiative. This entry was posted in Ada Initiative news, AdaCamp, Ally Skills Workshop, Donation drive, Sponsorship and donations and tagged adacamp melbourne, linux.conf.au, supporter newsletter on January 8, 2012 by Mary Gardiner. Reminder: register now for Girl Geek Dinner Melbourne! 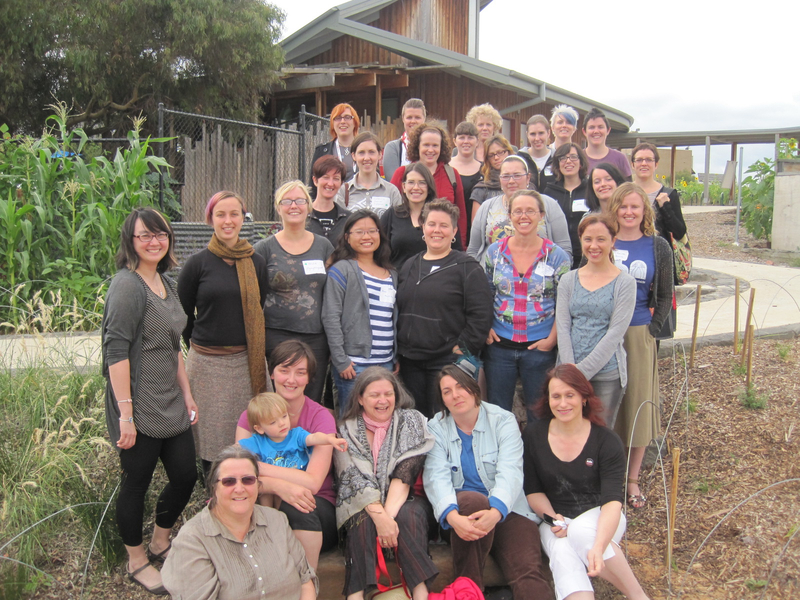 A reminder that AdaCampers and non-AdaCampers alike are all welcome to the Girl Geek Dinner taking place right after AdaCamp Melbourne, at the Merri Table & Bar at CERES Community Environment Park in Melbourne. When: Saturday January 14 2012, from 6pm. Cnr Roberts and Stewart Streets, Brunswick East, Melbourne, Australia. Register and pay at EventBrite by January 7. Thanks again to Brianna Laugher and the GGD Melbourne crew for organising this dinner. This entry was posted in AdaCamp and tagged adacamp melbourne, australia on January 5, 2012 by Mary Gardiner. Girl Geek Dinner Melbourne, right after AdaCamp! AdaCampers and non-AdaCampers alike are all welcome to the Girl Geek Dinner taking place right after AdaCamp Melbourne, at the Merri Table & Bar at CERES Community Environment Park in Melbourne. Register and pay at EventBrite by January 7, unless sold out prior. Note to AdaCampers: the GGD admission is not included in AdaCamp, please register and pay separately. Thanks to Brianna Laugher and the GGD Melbourne crew for organising this dinner. This entry was posted in AdaCamp and tagged adacamp melbourne, australia on December 22, 2011 by Mary Gardiner. Alex “Skud” Bayley, founder of the Save Aussie Music archiving project, open source technologist, free culture advocate, and expert in Internet technologies and social media. Sky Croeser, Curtin University researcher into social movements and control of information, board member of Electronic Frontiers Australia, and a member of the organising collective of the Bluestocking Institute for Global Peace and Justice. Viv “tigtog” Smythe, prominent Australian feminist and political blogger, and founder of the Hoyden About Town and Gagging For It projects. Pia Waugh, adviser to Senator Kate Lundy, co-developer of the Public Sphere” consultation methodology and director of the first GovCamp event in Canberra. Lisa Dempster, director of the Emerging Writers Festival, and digital publishing advocate. Selena Deckelmann, open source developer, major contributor to PostgreSQL and founder of the Open Source Bridge conference among several others. Valerie Aurora and Mary Gardiner, founders of the Ada Initiative, will both be attending AdaCamp as its hosts. AdaCamp is an event that brings together people interested in issues facing women in open technology and culture, to share their experiences and develop ways to support and promote women in these fields. If this sounds exciting to you, apply today! Applications close very shortly. Note to applicants: we have not yet finished reviewing all applications, so you may not yet have heard the result of your application. Please contact adacamp@adainitiative.org if you have any concerns. This entry was posted in AdaCamp and tagged adacamp melbourne, australia on December 13, 2011 by Mary Gardiner.